The Kidsaw Kudl Kids 1580 drawer unit with changing board is the classic version of the chest of drawers. It convinces from the beginning with high quality and appealing design. The shapely and practical changing table makes baby care easier. The Kidsaw Kudl Kids 1580 drawer unit with changing board is the classic version of the chest of drawers. It convinces from the beginning with high quality and appealing design. 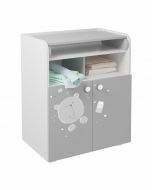 The shapely and practical changing table makes baby care easier. 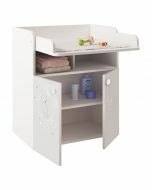 In the drawers and shelves everything can be found, what is needed to wrap, and hands remain free for your child. The four large drawers offer plenty of storage space. Thanks to the guide rails, the drawers are easy to put on and take off. With the discreet design and its classic appearance, the dresser fits in almost every room and every style of living. 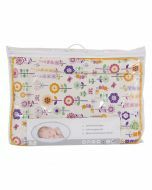 The foldable changing mat saves space and if your child no longer needs to be wrapped, then the changing table can also be used as a chest of drawers - A changing table, which grows. 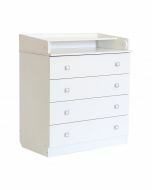 The chest of drawers is available in different colours. Product Dimensions H.92 x W.48 x D.81cm.